Once children become able readers, it is important to give them a range of text formats, styles and content to nurture reading habit and strengthen their friendship with books. This is where poems can weave their magic. 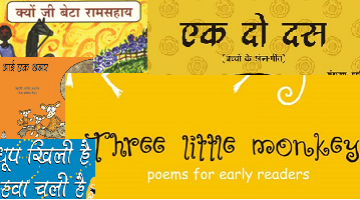 Thus these set of poems, plays, rhymes – mostly in Hindi – which are often based on the oral traditions of India, were developed to do exactly that: forge a friendship between children and written texts, and make them life-long learners. All the poems/rhymes/play songs are simple and easy to sing and play act. Useful for teachers, especially in the Hindi belt of India, as a bank of activity ideas for language teaching and learning. Many of the Hindi poems can even take them back to their own childhoods. कविता के माध्यम से भोपाल शहर के एक हिस्से का किस्सा बयाँ करते-करते हमारे आस-पास के पेड़-पौधों की देखभ..
A collection of short, interesting couplets/poems. ..
मज़ेदार कविता। केवल हाथी ही नहीं जंगल ही सजीव हो उठता है। ..
A collection of poems whose rhythm and rhyme are bound to attract listeners and readers. ..
Collection of carefully chosen couplets created by famous poets, especially for beginning readers. ..
खेल-गीतों का ज़िक्र आते ही बच्चों के साथ-साथ बड़े भी अपने बचपन में लौट जाते हैं। खेल-गीतों से कोई न को..
An enthralling collection of poems for early readers. The book also suggests various exciting activi..
A collection of beautiful poems on things that are in motion and moving – the wind, raindrops, birds..
यह कितन कविताओं की एक मज़ेदार दुनिया है जिसमे देश के चर्चित कवियों की कवितायेँ है। हर मिज़ाज़ की ..
Collection of short poems. Bold font size and attractive illustrations will attract early readers to..